SuperACE is a complete custodial management and job control system. This software is designed to enhance the accountability and productivity of custodial operations. It enables the custodial manager to make the most of his/her resources while encouraging the practice of sound fundamental management techniques, including: documentation, planning, scheduling, communication, follow-up and analysis. The program originated in 1990. The latest release is fully Windows compatible and offers many new features and capabilities. It is "user friendly" so persons with only minimal computer experience or training can operate the system. No pre-loading of data is required, and there are many features to speed entry of data including record copy and field copy. SuperACE is used by the custodial manager to: (1) document, plan, schedule and monitor routine custodial work, (2) to organize the flow of information, (3) provide printed cleaning schedules, (4) evaluate impact from changing cleaning standards or methods, staffing, or cleaning inventory, and (5) produce management reports relating to backlogs, progress, problems, work status, labor costs, equipment repairs, employee and accounting data. SuperACE does more than merely assist with the mechanics of managing custodians and housekeepers. You can confidently focus on vital issues such as staff development, levels of service, proper methods and materials, problem areas, and more. Effective management of custodians and housekeepers translates into longer lasting, cleaner, safer, more sanitary buildings at reduced cost. 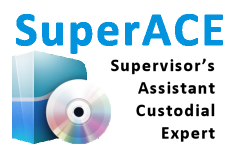 SuperACE is an extremely practical, affordable software solution that enhances your ability to manager your cleaning program and personnel.